Last month I attended the first ever My Open Kitchen Gathering in Orange NSW which was hosted and organised by Sophie Hansen of the blog Local is Lovely. The My Open Kitchen project stemmed from Sophie’s Rural Woman of the Year win in 2016 and encompasses an e-course, podcast, workshops and now this Gathering. All are focused on the food and farming community and learning to bring social media into the fold to make better connections. The My Open Kitchen Gathering brought together ‘IRL’ all the things that are taught in the e-course and that are spoken of on the podcast, with a series of panel discussions from some super interesting women in the food/photography/social media space. The keynote speaker for the day was Sara Taster of the blog Me & Orla. Coming all the way from the UK to speak, having Sara there was like an amazing private live episode of her podcast Hashtag Authentic. Sara spoke eloquently on her Instagram and small business journey, and about how we all have a unique and unrepeatable opportunity in life as each of us are unique and unrepeatable. 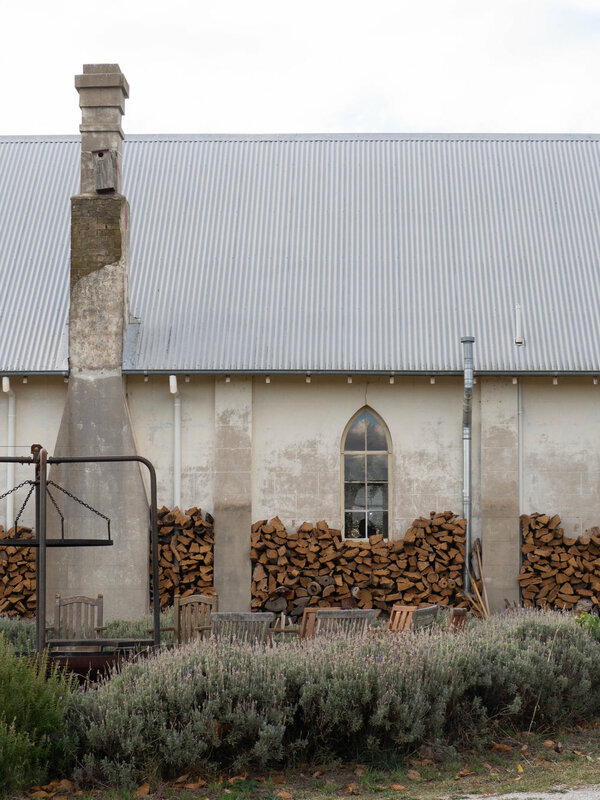 My Open Kitchen Gathering 2018, held at the Old Convent in Borenore NSW. The day also brought together lots of ‘Insta-friends’ and My Open Kitchen e-course friends, and it was so great to finally meet these lovely ladies in person and catch up with those I’ve met at previous workshops. As My Open Kitchen has a heavy focus on farmers and producers, there was a little marketplace where attendees could sell some of their produce/wares during the lunch break on the day. I was particularly interested in the dried quinces sold by Sue of Singing Magpie Produce. After being in the same e-course group as Sue late last year, I had heard a little about her products and was very intrigued by the quinces. I managed to sample a little of the quince - which was absolutely amazing, but missed out on buying a packet. A week or so after the Gathering I ordered some online and eagerly awaited their arrival. When my package from Singing Magpie Produce arrived it made my week. I was having a particularly bad week having been bed ridden after complications from a procedure in hospital I had the week after the Gathering. The quinces are a deep burgundy colour and have a slightly sticky texture, not all shrivelled up and bone dry like dried fruits from the supermarket shelf. I kept them in my room for a few days as an emergency snack until I was feeling better and was allowed to move about again. I then began thinking about how I could bake with them. The below recipe for quince scones is what I came up with. I figured if dried dates and sultanas can go in scones, then why not these? Preheat oven to 200 degrees Celsius. Line a large baking tray with baking paper, and dust a little flour over the top. Place the flour, icing sugar and cinnamon in a large bowl, and sift over the baking powder. Using a whisk mix the dry ingredients together. In a jug, quickly and briefly whisk the cream, water and lemon juice together, then add to the dry ingredients. Add the chopped dried quince and mix together with a flat bladed knife, then turn out on to a lightly floured bench. Lightly knead the dough to bring it together, then press to dough out until it is 2-3cm thick. Using a 4.5/5cm cutter cut out rounds from the dough, dusting the cutter with flour if the dough sticks too much. Place the rounds on the prepared tray, leaving no gaps in between each round. Bring the dough back together and continue cutting until it is all used up. Brush the tops of the cut scones with the beaten egg ensuring only the tops are covered and it doesn’t drip down the sides. Bake for 15-20 minutes, until golden and puffed. Turn the tray around in the oven about halfway through so they cook and colour more evenly. Serve warm with the butter. Reference: ‘Bill’s Basics’ by Bill Granger (HarperCollins Publishers, 2010), p.50. I seem to have a thing with ginger lately. Maybe it’s just that the warming nature of such spices go so well with Winter, or maybe I’m just a creature of habit. I haven’t always been this on board with ginger, I actually used to hate it. As a child the heat of it was too overpowering for me, and only very mild gingerbread biscuits would do. I remember the one time we all went overseas to the UK as a family, I was about 8 years old, and I become enamoured by Harrods - the lovely building, their constant use of teddy bears, all the food, and the fact they had a shop at the airport. When we were at Heathrow on our way home, I convinced Mum to buy a packet of Harrods Gingerbread as a snack for the plane. No doubt the packaging grabbed me, I’m sure it was cute enough to grab a child’s attention. Eating them on the plane, my mouth was on fire. They were so gingery, more than my underdeveloped taste buds could handle. I probably annoyed the air hostesses by asking for so many glasses of water, as I continued to eat the spicy gingerbread men despite the heat - probably as Mum had drilled into me how expensive they were (back then the Pound to Australian Dollar conversion was even worse than it is now), and to be honest as a picky eater I probably preferred them to the airplane food. Many years later, after making many a gingerbread man myself, I suddenly realised any aversion to ginger was long gone. I was walking back to the station from my internship, which conveniently meant walking past Bourke Street Bakery. I didn’t stop in very many times over the course of my internship, but the first time I did I decided to get one of their famous Ginger Brûlée Tarts. As I was close to finishing the tart, I realised I really couldn’t taste any ginger. The tart was nice, but thinking I still wasn’t a big ginger fan, I expected the flavour to hit me in the face. It was then I realised I must like ginger much more than I realised, and just kept thinking I didn’t as I hadn’t when I was younger. In fact, I liked it a lot, along with a few other things I hated as a child. So now I jump at any opportunity to cook with ground ginger in particular, and this cake is no exception. This cake paired with the quince ice cream is a seriously good way of celebrating the colder seasons (even though it seems to be warming up a little now!) and a good way of using up some poached quince if you have any (or have the inclination to make some). I can vouch for the fact that the ice cream is amazing on its own, so I would highly recommend making it even if you don’t need it as an accompaniment to a cake. What ingredients or foods did you hate as a child but like now? Let me know in the comments! In a blender, puree poached quince with half the poaching liquid until it is smooth. Add the remaining poaching liquid and blend to combine. Set aside. Place a pot of water on the stove and heat until it is boiling. In a heatproof bowl, that is able to comfortably sit over the boiling pot of water, add the egg whites, sugar, golden syrup and a pinch of salt. Place the bowl over the boiling water and whisk continuously until the sugar dissolves and the mixture becomes frothy and opaque, or when the mixture reaches 75 degrees Celsius on a candy thermometer. Remove from the heat and transfer to the bowl of a stand mixer fitted with a whisk attachment. Whisk the warmed egg white mixture until it forms stiff peaks of meringue. In a separate bowl, whip the cream with the yoghurt until it forms soft peaks. Gently fold in the meringue, then the pureed quince. Pour into an ice cream machine and churn according to the manufacturers instructions. When ready, the ice cream should be softly frozen, thickened and clinging to the paddle of the machine. Transfer to a freezer safe container to freeze until ready to serve. Pre-heat your oven to 180 degrees Celsius, then grease and line the base and sides of a 22cm (approx.) square cake tin. Sift the dry ingredients together into a large bowl. In a small saucepan, add the quince, golden and maple syrups and the margarine/butter and warm over low heat so everything melts together. Add the quince and brown sugar and allow the mixture to simmer for a couple of minutes, stirring occasionally so it doesn’t stick to the bottom of the pan. In a small bowl, briefly mix the eggs and the milk together. Pour the syrup and butter mixture in to the dry ingredients, and mix well, ensuring there are no lumps of flour. Add the eggs and milk and mix to combine. Pour the batter into the prepared tin and bake for 30-35 minutes, or until a skewer comes out clean when inserted into the middle of the cake. Cool the cake in the tin for a few minutes before transferring to a cooling rack lined with baking paper (the cake will stick otherwise). Cut the cake into squares and serve warm or at room temperature with a scoop of quince ice cream and some extra poached quince. 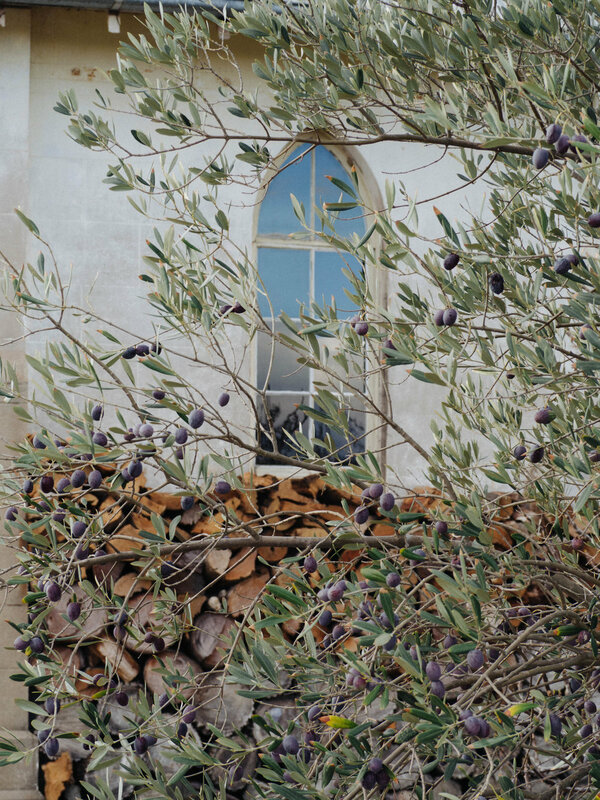 References: ‘The Violet Bakery Cookbook’ by Claire Ptak (Ten Speed Press, 2015), pp. 184-5; ‘Annie’s Farmhouse Kitchen’ by Annie Smithers (Hardie Grant Books, 2017), pp.52-3. I was inspired to make crumpets again after having an amazing breakfast at Synonymous Cafe in Medlow Bath while I was away a few weeks ago. The crumpets we had there were really good, and the combination of accompaniments got me thinking that I should be serving crumpets at home with more than just butter/margarine and vegemite. Keeping with the travel inspiration theme, I decided to pair my crumpets with quince I had poached after buying some from the Agrestic Grocer in Orange while we were away, and amazing cream from Dubbo based Little Big Dairy Co whose milk we enjoyed at a few cafes in the Central West. 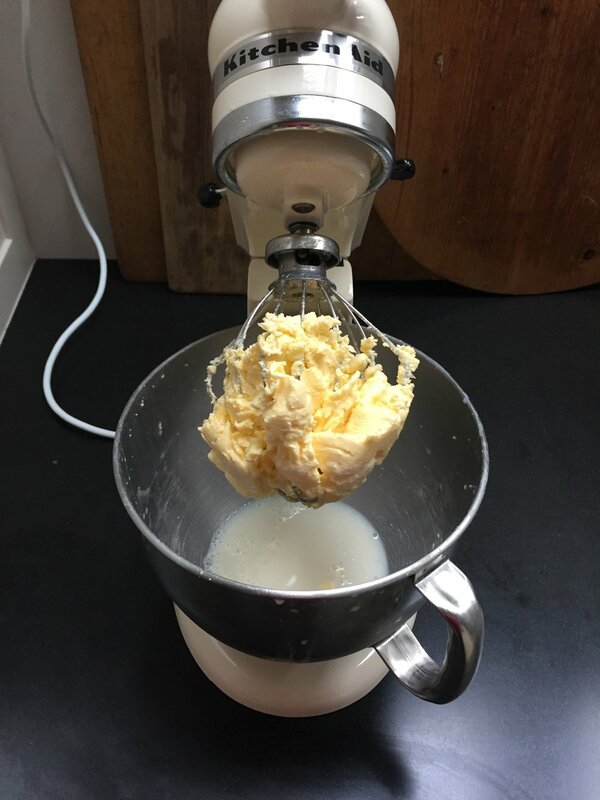 I also Little Big Dairy Co's pouring cream to make the butter as well, and the resulting buttermilk can be used for this recipe also - just top up the quantity with another milk if you don’t get quite enough. I did this the second time I made these, and used Little Big Dairy Co’s unhomogenised full cream milk, which I think is the nicest milk I’ve ever tasted. The first time I made these I used Pepe Saya’s Buttermilk, which is a by product of the butter making process. As you can see I really like supporting great Australian small businesses, and buying local when possible. I love to support people who are passionate about food, and make a top quality product like Pepe Saya and Little Big Dairy Co. And I have to say it’s so worth it when you cook with products from these small producers and the taste is so much better than you’ve had before. Do you ever find cooking inspiration on holidays? And what are your favourite small food businesses and producers you love to support? Let me know in the comments below, I’d love to add to more to my list! This is well worth the effort, and in fact it’s not really that much effort. All you need is a stand mixer, whisk attachment, muslin and some pouring cream. Use the best quality cream you can find, as it will produce a nicer quality butter and buttermilk. Both the butter and buttermilk can be used straight away for frozen or another time, so no need to stress about using a whole litre of cream, it won’t go to waste. 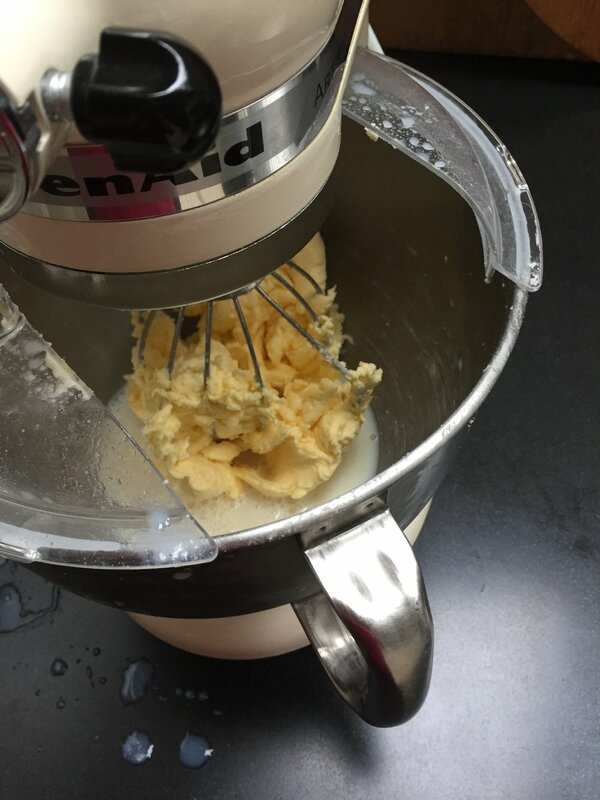 You can however use any quantity of cream, as long as it is enough for the mixer to process. Pour the cream into the bowl of a stand mixture fitted with the whisk attachment. Start mixing on medium-high speed, covering the bowl with a tea towel if the cream is jumping out and making a mess. After a couple of minutes of constant mixing, the cream will thicken and become whipped. Continue mixing for a few more minutes (at least 5), and the cream will start to turn a yellow colour. In the next few minutes the butter will begin to separate from the buttermilk - you might want to cover the bowl with a tea towel again as I find the buttermilk jumps out of the bowl quite a lot. 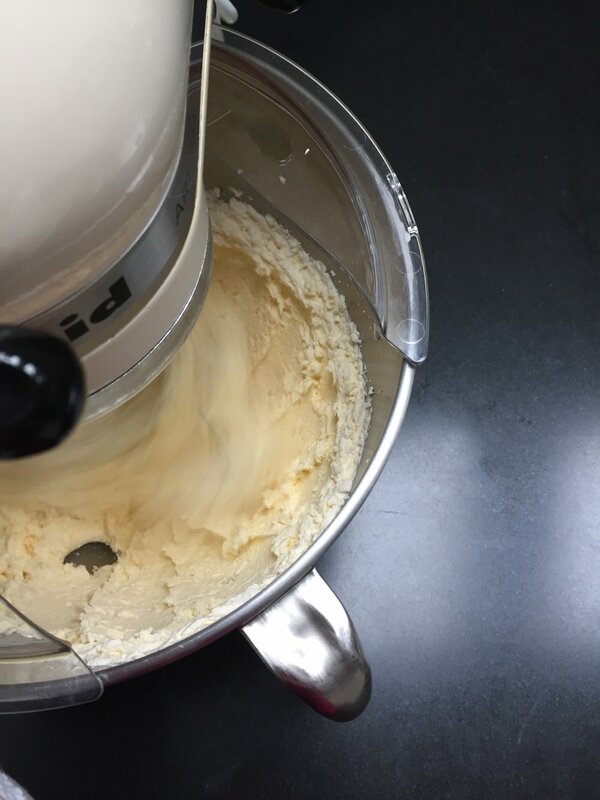 Continue mixing for a few more minutes, or until the butter and the buttermilk have completely separated. Place a large colander over a bowl, and line the colander with the muslin. Pour the butter and buttermilk over the colander, then squeeze out the butter over the colander using the muslin to release more of the buttermilk. The buttermilk can be used in the below recipe, kept in the fridge for a week or frozen for later use. Rinse the butter in cold water, then knead on a dry surface to release more of the buttermilk. 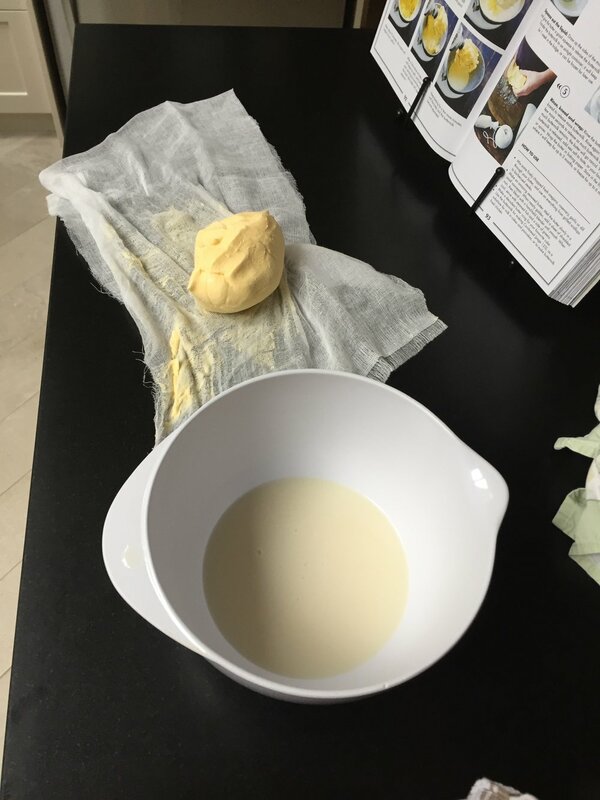 This process is essential to give the butter a longer shelf life as, if too much buttermilk remains the butter will go off. Rinse the butter again and knead until most of the buttermilk as been released. 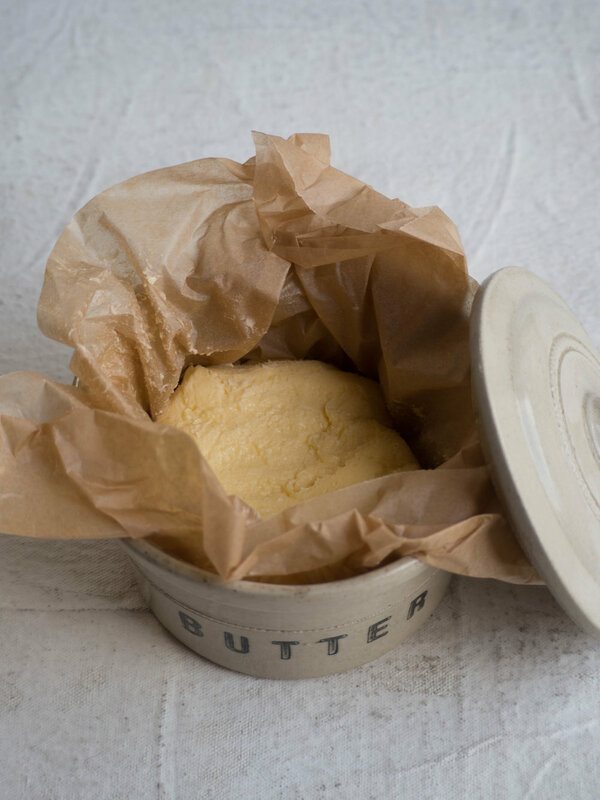 Roll the butter into a log or shape into a disc and wrap with baking paper and seal. Use for the below recipe and store in the fridge (it should keep for a couple of months), or weigh it out into portions and freeze. This was my second recent attempt at making crumpets from scratch. I have posted a recipe for crumpets before, but have since found a new recipe I like better and have worked out the best way to cook them. They key is to cook them low and slow, so you give the tops time to bubble and burst, giving that distinctive hole-y top crumpet look, without over cooking the bottoms. You will need crumpet rings for this recipe but you can use egg rings, which will give a smaller fatter or larger thinner crumpet depending on their size. I had been searching for crumpet rings all over for a few years, and finally found some at the Lost & Found Department where they had sourced crumpet rings and handmade cake tins etc from a supplier in Tasmania (if my recollection of the story is correct). As I mentioned above, I used buttermilk from the butter making process for this recipe. If you can’t get any or aren’t making the homemade butter, just substitute with regular or skim milk. Don’t substitute with cultured buttermilk (the thicker variety found in supermarkets), I’m not sure the thickness of it will work well with this recipe. Warm the milk and water (55ml) in a saucepan over low heat, then add the sugar and stir. Don’t overheat the milk. Place the flour into a large bowl and stir in the yeast. Pour in the warmed milk mixture and mix together until smooth. Cover the bowl with plastic wrap and leave in a warm place to rise. The batter will be ready when it has risen and become frothy and full of bubbles, this should take around hour, but leave for longer if the batter hasn’t become very bubbly after an hour. When the batter is ready, mix the bicarb soda with water (50ml) then mix into the batter until smooth. Grease the insides of the crumpet rings with butter, and heat a large flat plan on low heat. Grease the pan with some butter and place the rings on to the pan (how many you use at one time will depend on how large your pan is). Fill the crumpet rings with batter, until the surface of the ring on the pan is fully covered and the batter comes up around a quarter to half way up the crumpet ring (this will depend on how big you want your crumpets to be, allowing for them to rise a little). Cook for about 5 minutes, keeping the pan on low heat, or until bubbles then holes appear on the top of each crumpet. This is a slow process so don’t be tempted to rush it. Flip the crumpets over once the holes have appeared on the tops, and cook for another couple of minutes or until golden - you can remove the crumpet rings at this point, and allow them to cool a little before re-greasing them to use again. Continue with the remaining batter. I found the batter made about 10 crumpets. Serve straight from the pan, or warmed up later on under a grill with fresh butter, cream and poached quinces, or any other topping you fancy. References: ‘Fortnum & Mason The Cookbook’ by Tom Parker Bowles (4th Estate, 2016), p.60; ‘Real Food Projects’ by Kate Walsh (Murdoch Books, 2016) pp.92-3. This recipe is highly inspired by my Grandma’s cooking. Although I don’t think she ever poached quince or made her own ice cream, crumbles were definitely a staple dessert in her house. Rhubarb was the filling I remember most and as I have alluded to before, I would not try the Rhubarb Crumble’s my Grandma made. This was in protest of the fact that the dessert wasn’t Pavlova, which was, to me the only obvious choice for dessert at any time of year. My Grandma’s Pavlova was my absolute favourite (still evidenced by how many times it has appeared in some form on this blog! ), and I remember feeling such bitter disappointment when I noticed it had not been my Grandma’s chosen dessert that evening. While the pink hue of the rhubarb should have drawn my interest as a child, I was firmly opposed to the idea of eating a vegetable in a dessert, even if it was served with ice cream. I would then moodily sit eating my plain vanilla ice cream, hoping our next visit would include my favourite Pavlova. Now being older and having made much more of an effort to try new foods, I have come around the to humble crumble. I could not however find amongst my Grandma’s hand written recipes, a recipe for any type of crumble. It is likely it was something she started making later in life, maybe seeing it made on one of the cooking shows on TV she liked watching, or amongst the recipes found in the newspaper. I did however stumble across a little section in her copy of ‘Delia Smith’s Complete Cookery Course’ on crumbles and I guess it is also possible the recipe she used or was inspired by came from there. The book is ‘a new edition for the 1990s’, which would fit in well with my thought that she made many more crumbles later in life. It also fits in rather perfectly with my childhood memory of boycotting her rhubarb crumble. My Grandma’s copy of Delia’s book, looks somewhat used, maybe just a little less so than her handwritten notebooks and recipe books from the 1950s. A few pages are marked with scraps of paper with handwritten recipes on them (including a lemon sponge and oatmeal cookies), and a couple of cut outs from the food section of a newspaper (one recipe and one reader cooking tip). There is also a bookmark from the Stroke Foundation holding the place between Spanish Pork with Olives and Ossobuco in the ‘Meat: Casseroles and Braised Dishes’ section. Such a find is slightly bittersweet considering how my Grandma’s life came to an end, but also a reminder of her understanding of her vulnerabilities and attention to preventing them. Finding little notes, recipes and newspaper cut outs in my Grandma’s cookbooks give me little snapshots and reminders of her every time, and maybe one day in another book I’ll find a scrap of paper with a recipe for her crumble. For my crumble recipe I have used a combination of fruit which is slightly more Winter-y, however I thought equally as delicious and satisfying during any season. If you have some poached quinces definitely use them, they work so well with the crumble topping. If you wish to substitute the quinces for something else, I would suggest rhubarb (of course! ), either sliced finely with a mandolin or lightly softened on the stove first - just keep the quantity of rhubarb about the same as the quinces or so it fits nicely into the dish you are using. If making, the ice cream should be made earlier in the day or the night before so it has ample time to freeze. It is quite a simple ice cream recipe, requiring no eggs just some sugar, milk, cream and vanilla. I would suggest doubling the ice cream recipe if you wish to feed more than 5 or so people. Whisk the milk and sugar together until the sugar has dissolved and the milk has become frothy. Then add the cream and both vanillas and whisk until combined. Transfer mixture into the bowl of an ice cream machine, and process according to machine instructions. I found the churning process took about 10-15 minutes. Once ready, transfer ice cream into a freezer safe container and freeze for at least 2 or 3 hours. Remove the poached quinces from their poaching liquid, reserving the liquid. Roughly chop the quinces and place into a large mixing bowl. Very finely slice the apples and pears (I used a mandolin), discarding the cores. Place in the bowl with the quince and gently mix together. Add the vanilla bean paste and the quince poaching liquid and mix again. Then tip the mixture into a 2-2.5L capacity pie/gratin/baking dish. Spread the mixture out so it sits in the dish evenly. To make the crumble topping place the flour, oats and cinnamon into a mixing bowl then add the butter. Rub the butter into the flour and oats until the mixture starts to look crumbly. Add the sugar and mix well. Spoon the crumble mixture over the fruit ensuring it is evenly dispersed. The thickness of your crumble topping will depend on the size and depth of your dish. I used a fairly deep dish so I ended up with a nice thick crumble topping. Cook crumble for 30-40 minutes, or until the top has turned lightly golden brown. Serve warm with the vanilla ice cream. References: ‘Lomelino’s Ice Cream’ by Linda Lomelino (Roost Books, 2015), p.13: ‘Delia Smith’s Complete Cookery Course’ by Delia Smith (BBC Books, 1998), pp. 594-5. After 17 weeks, many frustrating meal times and far too many toasted sandwiches, our new kitchen is done! At the 17 week mark we were able to put most things back in the kitchen and use it (finally! ), and after a few more weeks the last finishing touches and changes were done. Now all we need is another coat of paint and the longest kitchen renovation will be officially complete! I have been immensely enjoying being back in the kitchen. Not being able to bake for 4 months was almost like torture for me! Now I am trying to spend every spare moment in there, baking all the things I have been thinking about since late February, and making the most of seasonal produce I have been so desperately wanting to cook with. Such seasonal produce, includes quinces. Since finding some good poaching recipes last year, my enthusiasm for cooking (and eating) homemade poached quinces has only increased. When June arrived, and our kitchen was still in renovation mode, I did begin to panic that I may miss quince season all together and have to wait another whole year to enjoy them. Luckily the renovation finished just in time and I have poached three lots of quinces (on a new gas stove none the less!). I have some stored in the fridge, with extra poaching liquid to use for whatever takes my fancy. Though served with ice cream and a drizzle of poaching syrup makes a nice simple dessert, and topping pancakes with them turn lazy weekend breakfasts into thoroughly gourmet affairs. After the publication of Country Style’s Heirloom Recipe Cookbook, in which my Grandma’s pavlova recipe was featured, I decided to go back to this favourite family recipe and give it a Winter twist. I also was keen to see how a familiar recipe fared in our new oven! Every oven seems to be different and it takes a little while to adjust. I am finding I’m needing to turn the recommended temperatures down at least 10 degrees in our new oven, and for this recipe I ended up baking the pavlova at 110 degrees Celsius (after the initial pre-heating). I have left the oven temperature in the recipe the same as my Grandma’s original recipe, however if you can smell the pavlova cooking too quickly (it will start to smell like the beginning stages of caramel/burning sugar), turn the temperature down accordingly. Note: Both the poached quinces and the pavlova base can be made in advance. The pavlova can be cooked the night before and left in the oven overnight to cool. Peel the quince and cut into quarters, removing the cores. Wrap the peel and cores in muslin. In a large pot place the quince and the muslin containing the cores and peel. Add the sugar and water, and cook covered over low heat, allowing the water to simmer, for 1 hour. After one hour check the quince by pricking a couple with a fork to check how tender they have become. The quince should become quite tender and soft, however remain whole and not break up. If the quince are not tender enough keep them on the heat, checking again after twenty minutes or so. This process should take between 1-2 hours total. Once the quince have become tender, add the vanilla bean paste and cinnamon quills to the pot. Gently stir everything together, then turn off the heat and leave to cool with the lid on. Once the quince have begun to cool, sterilise a couple of medium/large jars, by washing them in hot soapy water then placing in the oven for 20 minutes on a low temperature. Transfer the quince into each jar, then cover with as much poaching liquid as will fit. You may want an additional jar to store any remaining poaching liquid. Store in the fridge for up to a month. 8 quarters of poached quince, approx. Pre-heat oven to 200 degrees Celsius. Line a large baking tray with baking paper, and trace a circle approx. 26 cm in diameter (I used a dinner plate). In a clean dry bowl, beat the egg whites for 5-6 minutes, whilst gradually adding the sugar. Add the vinegar and vanilla and beat until the mixture is stiff and glossy. Place mixture onto the tray in the middle of the drawn circle. Push the mixture around to form a circle, leaving a small border around the edges. Try to keep the edges a little higher than the middle so any filling can sit comfortably in the middle later. Just before you are ready to serve the pavlova, place the mascarpone in a medium sized bowl and whip until it has thickened and soft peaks form. Gradually add the cream, vanilla and icing sugar until all ingredients have combined and stiff peaks form. Spread the mascarpone cream into the centre of the pavlova. Drain the quinces of syrup and sit them on top of the cream. Serve with the quince poaching liquid. Reference: Jamie Magazine, Issue 63 November 2015 p.31. I have loved quinces for quite a while now. We always buy Maggie Beer’s quince paste to have with cheese and biscuits, but I have to admit for quite a long time, I really didn’t know what quinces were. When you actually see the fruit, they look nothing like you’d expect, sort of like large lumpy pears. They aren’t a fruit that is eaten raw however, slow cooking is the only way to go for quinces. I have attempted cooking quinces three times now. Only once successfully. The key as I have now found, to the deep and rich ruby colour is to cook the quinces with the cores, and remove them after. Apparently lots of pectin is in the cores, which helps the quinces turn that lovely ruby colour. I have also found that poaching them in the oven, is much easier than doing it on the stove. To me, slow cooking and poaching feels like such a Winter-y thing to do. Probably because here in Australia, having the oven or stove on for hours at a time in Summer just isn’t practical! The fruits that lend themselves to such methods of cooking are also in season in the colder months. Though it seems few fruits and vegetables aren’t available almost year round. Quince is one of the rarities that only appear in green grocers or farmers markets once Autumn starts. Which to me is a very clear sign that Summer has come to an end, and it’s time to get Winter baking! I found this recipe for Quince Butter via Sophie Hansen of Local is Lovely, who never fails to impress me with snippets of country life and delicious recipes that can be found on her blog. When I saw the recipe, I just knew it would work much better than my last attempts. And it did. I didn’t follow the recipe to the end, just until I had poached the quinces. Though I don’t doubt that quince butter would be as tasty as it sounds! I used some of my poached quinces to make a frangipane tart (based on this recipe), then used some to make quince and vanilla muffins. I added four tablespoons of the poaching liquid to the muffin mixture, along with an extra quarter cup of self raising flour, one teaspoon of vanilla bean paste, topped each muffin with small pieces of poached quince and sprinkled them with raw sugar. I froze the muffins after they had cooled, and we are still enjoying them. The frangipane tart however, is long gone! Any left over poached quinces can be placed in a jar with the poaching liquid and stored in the fridge.